A switch was made to a crimson helmet shell, most completed with an Adams white plastic mask, and all with two and one half inch white identification numbers on each side. An offensive formation switch was made to a Wing-T Offense. A star was born to replace Cogdill when Hugh Campbell caught ten receptions against Denver but that game summed up the Cougars’ season as they ran up 514 yards in offense yet lost 28-26. Campbell completed the season number one in the nation in receptions and yards gained while QB Mel Melin was second in total offense and third in passing. QB-flanker Bruce Ellingsen enjoyed a good year, following his father and brother in the program. He and his brother Don later opened a successful ophthalmology practice. Jim Boylan led the defense with his five interceptions but the 4-5-1 finish despite a big offense that was augmented by the rushing and “do everything” work of HB Keith Lincoln disappointed fans as did the 8-7 loss to Rose Bowl bound Washington. A heralded high school quarterback from Monrovia, CA, the swift 6’, 205 pound Keith Lincoln was dubbed with the nickname “The Moose From The Palouse” but Lincoln was far from a plodding rusher. He was a do it all halfback and was often called upon to run, pass, catch, punt, and kick showing remarkable skill and versatility. Named to every “all time” Cougars’ team, Lincoln dazzled with ability more than statistics though he left the Wazzou campus as the all time leading rusher. As one of the stars of the American Football League’s early years, Lincoln became a true national star in 1963, topping off one of his five All AFL seasons with 329 total offense yards in the championship game against the Patriots. As he did at WSU he returned kicks (his longest at 103 record setting yards), had numerous 100-plus yards rushing games, made spectacular receptions and often, like his ninety-one yard catch and run, dashes afterwards. A member of the Chargers and WSU Athletic Halls Of Fame, he spent twenty-five years as Director Of Alumni Relations and was responsible for planning, designing, and pushing the famed Lewis Alumni Centre to its completion. 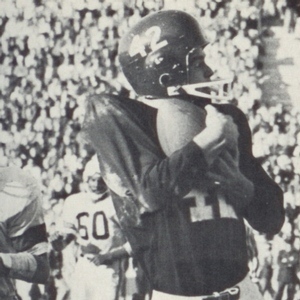 QB Mel Melin was replaced during the ’61 season by Dave Mathieson, both of whom coincidentally, would be the quarterbacks on the BC Lions in the CFL from 1962 through ‘64. They of course focused upon the nation’s leading receiver for the second consecutive year, Hugh Campbell who hauled in fifty-three passes. The rushing was handled by understated but very effective fullback George Reed. DB Jim Boylan was the key in the secondary while small in stature but big in heart lineman Bill Berry, became a highly successful international wrestler and the runner-up for the 1964 Olympic Wrestling Team. 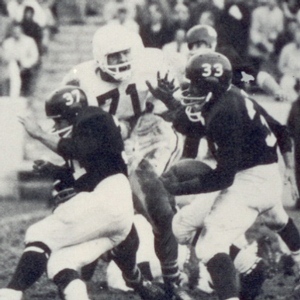 Mike Martin had a very good seven seasons at DE for BC in the CFL, splitting his final ’68 season with Montreal. At 3-7, many boosters were getting restless.